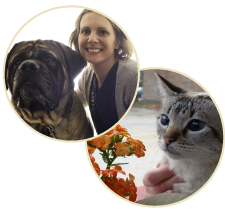 Jayme joined Whole Pet in March 2014 and has been a certified veterinary technician for the past 14 years. Originally from the Milwaukee area, she moved to Madison for school and fell in love with the city. Jayme is very passionate when it comes to working with our more timid and challenging patients and feels very lucky to be a part of such a special team. Jayme lives in Madison with her husband Keith, two girls Addison and Maya, and pets (Beef, Jasmine, Veni, Clementine and Stewart Little). In her free time Jayme enjoys traveling with her family and pets and skiing out West.